During several visits over the past few years I have been excited to see the archaeological work on the synagogue, market, dwellings, and harbor of Magdala—home of Mary Magdalene on the northwestern shore of the Sea of Galilee. This past June we visited the site under the leadership of one of the Magdala guides and although we were pressed for time, she urged us to visit the Chapel at Magdala. I am so glad that we did! View looking east at the “Women’s Atrium” of Duc in Altum. As we entered the atrium we were informed that it is dedicated to the women who followed and supported Jesus (Luke 8)—especially Mary Magdalene. On seven of the eight columns the names of women mentioned in the Gospels are engraved. The eighth column is not inscribed and represents women of faith through the ages. Here our guide encouraged women in the group to pray at the eighth column. A number of them, especially those who had experience trauma as women, did in fact do that—and later shared that this was a very moving and important experience for them. From the Atrium of the Women, we moved east into the Chapel of the Boat. View looking east at the “Boat Chapel.” To view details on this Panorama you are invited to Double Click on the Image. 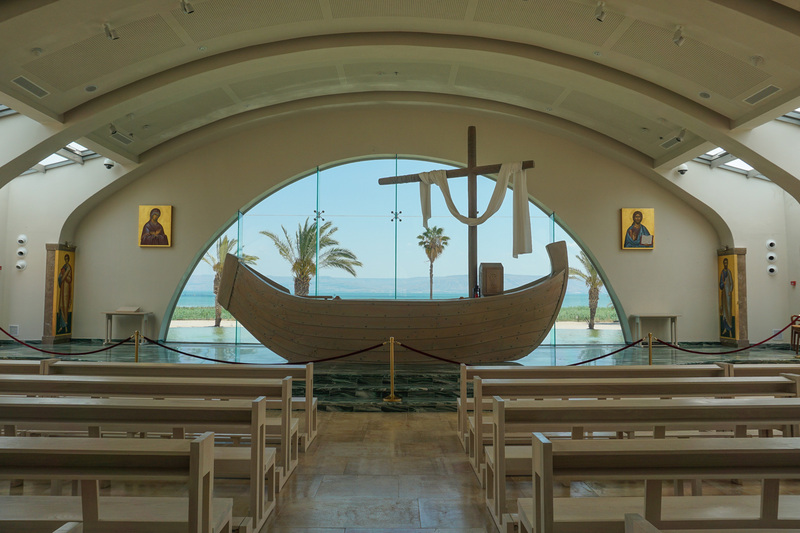 This chapel commemorates Jesus preaching from the boat of Simon Peter (Luke 5:1-11). The chapel seats 300 and along the sides of the chapel are pictures of the 12 male disciples of Jesus. 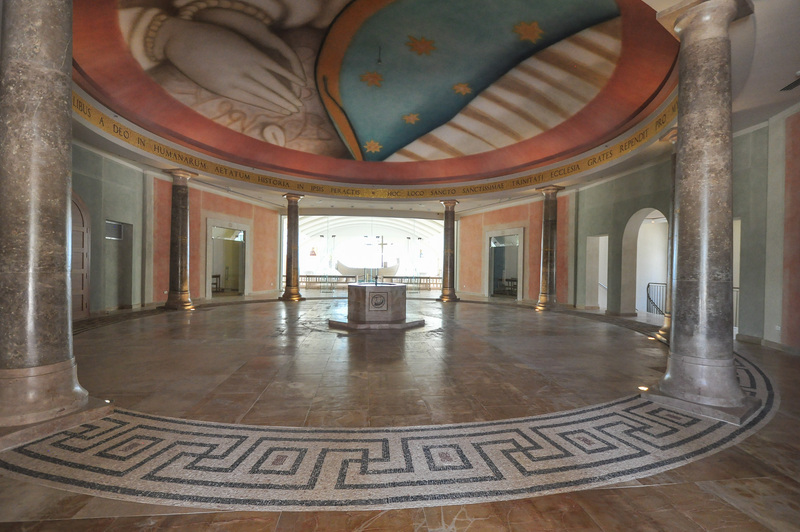 The altar’s design is based upon the 1st century boat that was excavated in 1986 along the shoreline near the chapel. The altar is made out of cedar wood. The “tabernacle,” that contains the elements for the Eucharist, to the right of the mast, was blessed by Pope Francis on May 26, 2014 during his pastoral pilgrimage to the Holy Land. As usual, I was very impressed with the antiquities at Magdala, BUT I am so glad that we set aside time to visit this chapel to experience the symbolism and testimony that the Legionaries of Christ are sharing with the world–at–large! If you visit the site, please budget 90 minutes for a complete visit—it will be very worthwhile! 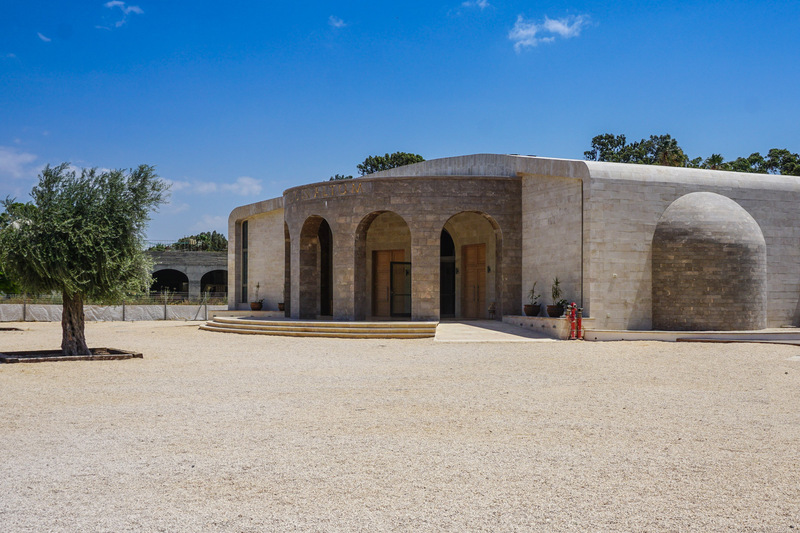 Additional information can be found at the Official Magdala Web Site. This entry was posted in Churches, Israel "Modern", Places in Israel and tagged Chapel, Doc in Altum, Magdala, Mary Magdalene, Panorama, Sea of Galilee, Simon Peter. Bookmark the permalink. Thanks for this, Carl! I’ve not yet been there and your pictures make me eager to see it on our upcoming tour. Thanks much.